The European Union is “one of the greatest political and economic achievements of modern times,” United States President Barack Obama said last week. While Europeans are turning increasingly against the Union, America’s president sounded more pro-EU than many of Europe’s own leaders. While in London on April 22, he provoked angry headlines with his comment that “the UK is going to be in the back of the queue” if it leaves the EU. But in Germany he delivered a much more positive speech. “She has been steady,” he said. “She is trustworthy.” That’s the real special relationship today. The bulk of his speech on April 25 focused on the European Union. “I’ve come here today, to the heart of Europe, to say that the United States, and the entire world, needs a strong and prosperous and democratic and united Europe,” he said, receiving applause. “Perhaps you need an outsider, somebody who is not European, to remind you of the magnitude of what you have achieved,” he told them. Has Mr. Obama talked about any other group of nations this way? The Trumpet has long warned that a strong, reasonably unified union of European nations would be a major rival and threat to America. Now, with the European project seemingly on the brink of disaster, Mr. Obama is fighting for it to hold together. He is encouraging the rise of the Holy Roman Empire—the empire that will bring about America’s demise. His threat to Britain shows the end of the special relationship between the U.S. and United Kingdom. But it also shows America’s commitment to the EU—he’s willing to threaten the nation that used to be America’s closest friend and ally in order to keep the EU together. 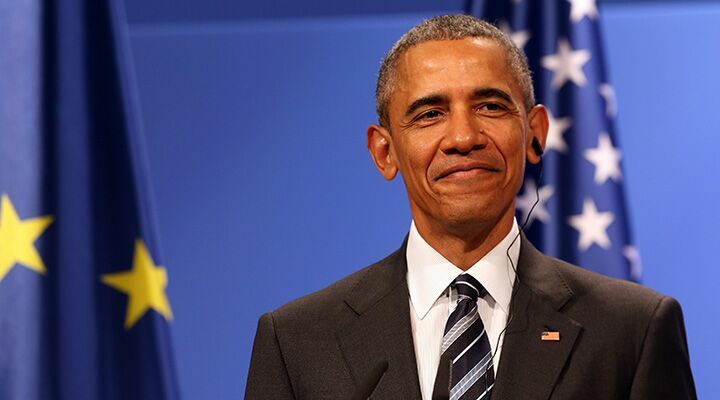 President Obama’s unblemished optimism about the European project is becoming increasingly rare in Europe. But he did have things he wanted Europe to fix. One of the top items on that list is a strong European military. “We need a strong Europe to bear its share of the burden, working with us on behalf of our collective security,” he said. “I’ll be honest, sometimes Europe has been complacent about its own defense,” he complained. But this strong support for Europe should not be surprising; the U.S. has encouraged the creation of this Union right from the start. All that American money built up Europe (but not Britain—a fact that some are still sore about today). But the U.S. also used that money to push integration. When France refused to play ball in September 1950, for example, America threatened to cut off the money. Postwar Europe quickly became a battleground between the Russians and Americans. The Soviets funded labor unions and socialist movements. The cia supported pro-democracy groups. The European project—back then in the forms of the European Coal and Steel Community and the European Economic Community—was one of the top recipients of American money. cia officials created and funded the American Committee on United Europe (acue). acue ran “a domestic propaganda campaign designed to persuade American public opinion of the need for a more united Europe,” wrote the Roosevelt Study Center. The cia “was funding the acue to the tune of about $1 million a year, making it one of the U.S.’s most expensive covert operations of the early Cold War period,” it wrote. The European Movement, led by Robert Schuman and former Belgian Prime Minister Paul-Henri Spaak, among others, was one of the most important groups pushing for the creation of a federal Europe. acue provided the majority of the movement’s funds—reaching as high as two thirds after 1952—and it funded its youth group entirely. This pro-European policy went right to the top. One memo from 1950, for example, giving instructions for a campaign to create a European Parliament, was signed by Gen. William J. Donovan. Donovan had been the head of the Office of Strategic Services, the World War ii precursor of the cia. Donovan chaired the acue, with the 1950s cia director, Allen Dulles, as the vice chairman. The cia’s first successful director, Walter Bedell Smith, was on the board. The Schuman Declaration that set the tone of Franco-German reconciliation—and would lead by stages to the European Community—was cooked up by the U.S. Secretary of State Dean Acheson at a meeting in Foggy Bottom. “It all began in Washington,” said Robert Schuman’s chief of staff. They wanted this to go further than simply a trading block. They wanted a power to counter the Soviet Union, and so America had the same vision of a European superstate that was held by federal Europe’s most ardent supporters. In a memo from 1965, the cia encouraged the vice president of the European Community to create a shared currency. But the cia wanted it done discretely, so that it wasn’t discussed “until adoption of such proposals would become virtually inescapable.” It wanted Europe to adopt a common currency to force it to unite further against the wishes of its voters—exactly the strategy adopted by EU elites in the 1990s with the creation of the euro. The cia also wanted Britain in the EU. So it worked to turn the Labour movement around from its euroskeptic stance. Aldrich wrote that “they sought to undermine the staunch resistance of the British Labour government to federalist ideas.” It’s impossible to tell if the Labour Party would have supported the EU without that help—it seems like it may well have done so—nevertheless the Labour Party changed course, paving the way for Britain to join the EU. That’s not to say the whole EU is something cooked up by the cia. It had plenty of support within Europe and from other powerful bodies, like the Catholic Church, for example. As Aldrich wrote, “The history of acue shows us prominent European politicians in search of discreet American assistance, rather than the CIA in search of proxies.” But America clearly nurtured, supported and encouraged the movement toward European federalism. Initially, a lot of the motivation for this support came from a desire to restrain Germany. Winston Churchill believed a united Europe (without Britain) could help solve the German problem and prevent Germany beginning another war in Europe. However, as time went on, this motivation was dropped entirely. Instead, America’s desire for a united Europe was driven almost exclusively by its competition with Russia. America is responsible for creating so many of the movements that threaten it today—and nowhere is that more true than in Europe. This power is becoming increasingly independent of the U.S., yet America’s leaders keep building it up. In America we are prone to see only one enemy at a time. For the past 13 or 14 years, the only enemy that we have been able to see is Russia. During World War ii, the only enemy we could see was Germany and, of course, the ally of Germany at that time, Japan. Russia was then, we thought, our ally.But now that Russia is our enemy and we see that enemy, we seem to think that Germany, Japan and the nations that we fought in World War ii are now our allies. America rebuilt Germany, including its military, to help defend against Russia. And it helped build the EU too.